Mark Dayton became the first DFL governor-elect in 24 years under the unlikeliest of circumstances on Tuesday night, beating Republican Tom Emmer by a final margin of fewer than 10,000 votes out of more than 2 million cast. The exceedingly slim margin - less than half of one percent - will trigger an automatic recount. Mark Dayton became the first DFL governor-elect in 24 years under the unlikeliest of circumstances on Tuesday night, beating Republican Tom Emmer by a final margin of fewer than 10,000 votes out of more than 2 million cast. The exceedingly slim margin – less than half of one percent – will trigger an automatic recount. The hand tally is likely to be acrimonious and protracted, stirring memories of the 2008 U.S. Senate contest between Norm Coleman and Al Franken. “We’re not going to get rolled this time,” said state GOP party chair Tony Sutton, in an indication of what’s on the horizon. Dayton had led in polls since September, but his victory came amid a Republican romp in the Minnesota Legislature that saw the party take control of both chambers. GOP candidates took 16 Senate seatsand 25 House seats out of DFL hands. The Republican blitzkrieg in legislative races stunned DFL leadership and far exceeded the expectations of GOP strategists and campaign officials, who believed they had a good chance at winning the Senate but only an outside shot at the House. Dayton’s win left analysts and onlookers on both sides arguing over how to view the outcome: Had Dayton accomplished a feat by winning, or had Emmer accomplished a feat by losing? There are many ways to parse so narrow a margin, but Emmer’s performance in the seven-county Twin Cities metro was certainly an outsized factor in his loss. Emmer netted about 72,000 fewer votes there than Gov. Tim Pawlenty amassed in his narrow 2006 re-election – 48,000 fewer in the DFL strongholds of Hennepin and Ramsey Counties, and almost 24,000 fewer in the other five, traditionally Republican suburban counties. Dayton underperformed 2006 DFL nominee Mike Hatch in the metro as well, but by lesser margins: -22,000 in Hennepin and Ramsey, -14,000 in the suburban counties. IP candidate Tom Horner got 51,000 more votes in the seven-county area than 2006 nominee Peter Hutchinson. 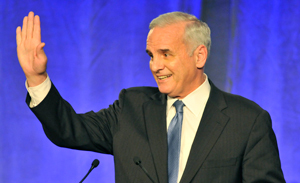 During his year-long run for the DFL nomination, Dayton stressed a single theme: taxing the state’s wealthiest residents to fill the lion’s share of Minnesota’s epic $6 billion budget hole. He also repaired a potentially fatal vulnerability in his campaign by taking the lead in disclosing that he had gone through an alcoholic relapse during the last year of his single term in the U.S. Senate. After winning the DFL primary in August, Dayton lingered for a time on his tax-and-budget message. But he soon got a visit from advisers, including emissaries from the Win Minnesota PAC that raised and spent over $5 million on TV ads attacking Emmer, who convinced him that he needed to shift his talking points to jobs and education for the general election. Within a matter of weeks, he had assumed a lead in polls that he maintained the rest of the way. The Emmer campaign steamrolled its way to a two-ballot win in the endorsement battle at the GOP state convention, but failed to seize the initiative in defining its candidate during the summer months when Emmer’s Democratic foes were busy running in a primary. In part that was a matter of financial stress: The campaign spent most of the money it had at the time in winning the endorsement race, and had less than $300,000 in cash on hand as of the first candidate reporting period in July. And that cash shortage, in turn, helped prompt the newly formed business PAC MN Forward to make its first TV ad a pro-Emmer spot. That generated a gay-rights backlash against Target Corp. that served to dampen future contributions to the group. Originally MN Forward aspired to raise $10 million to spend on Emmer’s behalf; as of the last pre-election reports, it had raised less than $2 million. Meanwhile Emmer was encountering troubles of his own. A seemingly off-hand public comment about reducing the minimum wage for bar and restaurant servers who receive tip income turned into a 10-day, top-of-the-news-cycle ordeal that the campaign could not seem to put an end to. And an ad produced by the liberal Alliance for a Better Minnesota that pointed to Emmer’s past DUIs and a bill he introduced to reduce drunk-driving penalties damaged him badly with women, according to sources in both parties privy to internal polling on the subject. Some Republicans say privately that Emmer was further harmed by his refusal to reach out more actively to moderates, and by his imperviousness to advice or criticism from Republicans outside the campaign. Dayton’s apparent victory, coupled with the GOP takeover of the Legislature, sets up the specter of an extremely contentious climate at the Capitol during the months ahead. In essence, it’s a reversal of the main dynamic from the past four years, when Gov. Tim Pawlenty and the DFL-controlled Legislature constantly clashed over budget decisions. At the least, Dayton’s hallmark plan to hike income taxes on the state’s wealthiest residents would seem to be dead in the water with the new GOP majorities. But with a recount looming, the immediate question of who will hold Minnesota’s top elected office come 2011 remains in limbo. It seems extremely unlikely that Emmer could make up nearly 10,000 votes during a hand tally, but the 2008 U.S. Senate contest proved that just about anything is possible. If nothing else, the recount could gum up work at the Capitol for months to come, an especially unsettling prospect given the state’s looming budget deficit. I don’t think Emmer was the wrong candidate. I think his campaign failed to put him out in front of voters. The straight-talking jovial Tom Emmer I saw in person was never the Tom Emmer I saw on TV or on billboards. He was sanitized, cleansed of his own identity. How his campaign could let an admitted tax hiker take control of a conversation about jobs and the economy, during a time when voters are nationally cognizant of the dissonance between raised taxes and job growth, will be a deep mystery for years to come. Even Minnesota was a let down. I figured a right wing maniac like Emmer would have lost handily. I guess having the third party Horner took more away from Dayton than I thought. Thank God for Al Franken and Amy Klobuchar who have the guts to take on the forces of Karl Rove and the far right who have eyed winning MN in the presidential races and not been a success.